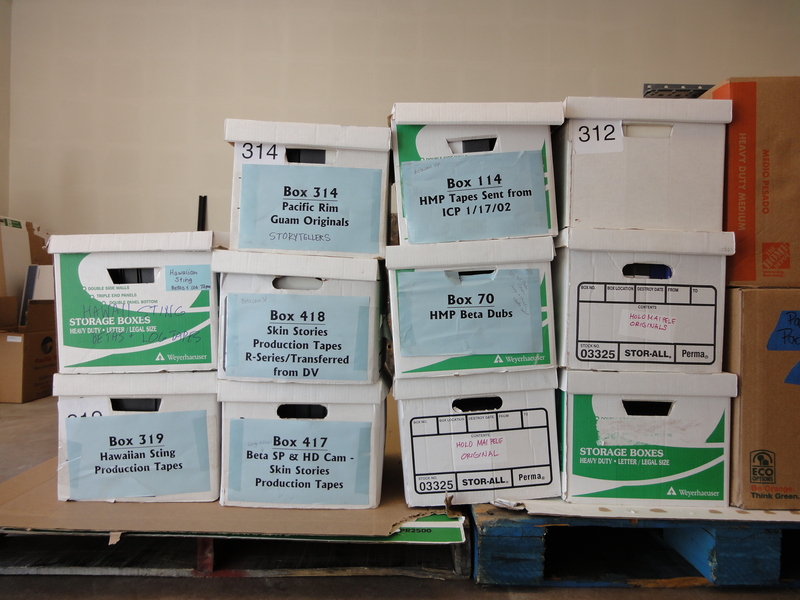 We’re excited to share that we’ve received about 80 items from the Protect Kaho‘olawe ‘Ohana (PKO). The collection includes raw footage, edited materials, and documents related to the activities of the PKO from the 1970s through the 1990s. The majority of videotapes are ½ EIAJ videotapes and VHS. From what we’ve learned thus far, it looks like these include footage of community meetings in Hāna, Kaunakakai, Kailua-Kona, Hilo, Lāna‘i City, at Kaua‘i Community College, and elsewhere around Hawai‘i. We’ll be taking a closer look at these in the coming weeks, so we’ll be able to gather more complete details and research on the contents. For those who might not be familiar with the ‘Ohana, the PKO is a grassroots organization dedicated to the island of Kaho‘olawe and the principles of Aloha ‘Āina throughout Hawai‘i. The organization was instrumental in stopping the bombing of Kaho‘olawe and in the return of the island from the United States military in 1994. Even today, nearly forty years after carrying out its first occupation of the island (which attracted national attention), the PKO continues to work actively to restore the health of Kaho‘olawe by revitalizing its natural and cultural resources. Many well-known individuals were members and leaders of the PKO, including Harry Mitchell, Kimo Mitchell, George Helm, Dr. Noa Emmett Aluli, Loretta Ritte, Scarlett Ritte, Walter Ritte, Davianna McGregor and Collette Machado. While we haven’t yet finished processing the collection, we wanted to share our excitement and let you know about this new collection. Check our website for updates and feel free to email us (uluulu at hawaii.edu) for more information. For more info on the PKO and on Kaho‘olawe, visit the PKO’s website (http://www.protectkahoolaweohana.org/) and the Kaho‘olawe Reserve Commission’s website (http://kahoolawe.hawaii.gov/home.php). ‘Ulu‘ulu is pleased to announce our latest acquisition, the Meleanna Aluli Meyer Collection. 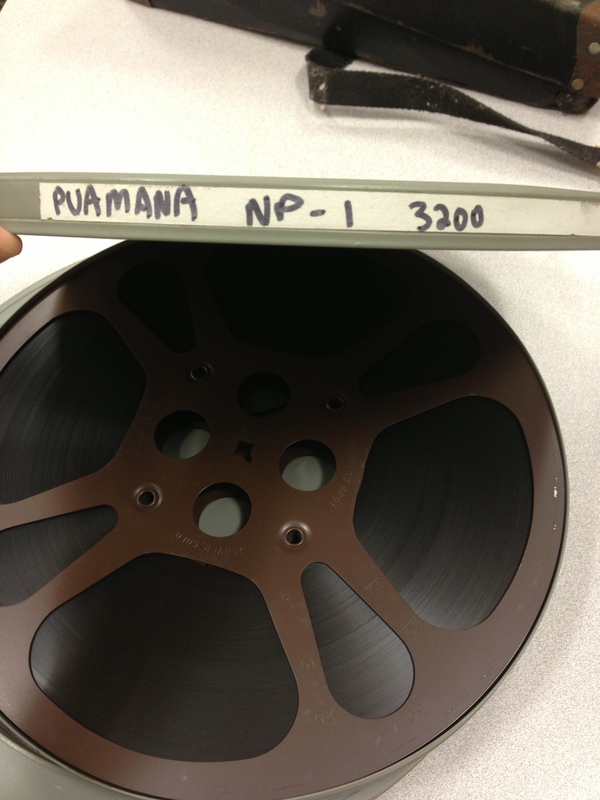 The collection includes original 16mm motion picture film reels and sound recordings created during the production of the documentary film Puamana in 1989-1991. Produced by Meyer, Puamana features interviews, songs and performances by Irmgard Farden Aluli, one of Hawai‘i’s most loved and influential musical composers. This acquisition is a timely one, as it comes very soon after the passing of noted documentary filmmaker Les Blank, who directed and shot the film, his only production in Hawai‘i. Meyer recalled an early meeting with Blank at his home in Berkeley, in which she saw several arrangements of flowers in all corners of the house. She instantly knew that anyone who could appreciate and fill their home with so much natural beauty was the person to capture the story of Puamana and Auntie Irmgard that Meyer envisioned. 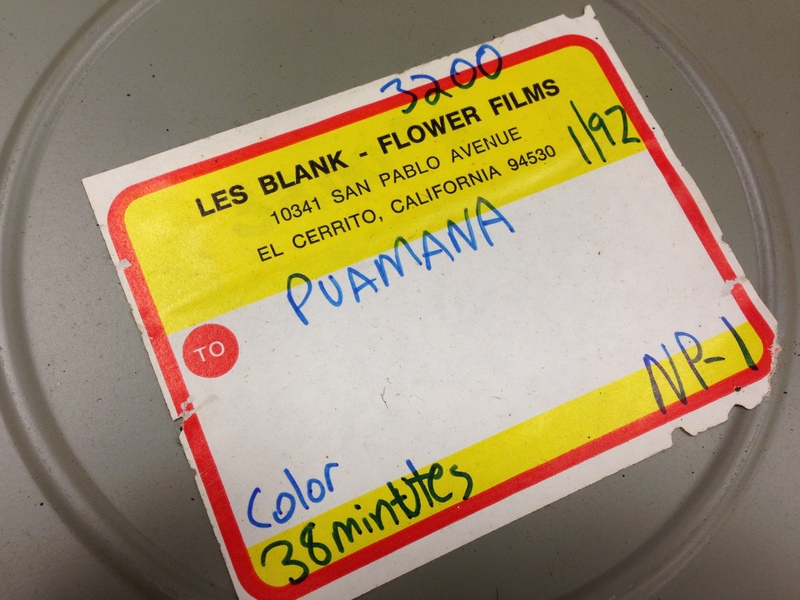 The approximately 40 hours of raw footage, audio and outtakes are a unique resource that will be available to researchers for the first time, and ‘Ulu‘ulu is honored to be their caretaker. Christmas came early to ‘Ulu‘ulu this year as we’ve recently acquired the KITV Collection which includes programming and news footage of events like the Merrie Monarch Festival and specials like The Don Ho Christmas Show. 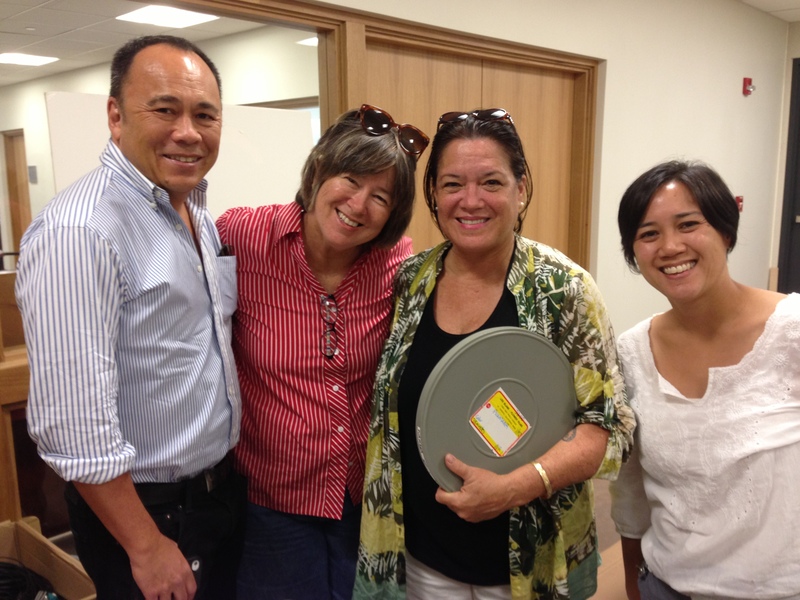 Preserving and archiving this footage is important because it informs future generations and researchers about trends and cultural and political events from different time periods in Hawaiʻi. We are excited to have this material in our collection. The archives will be closed during the UH West Oahu Winter Break starting December 17 and will reopen on January 2, 2013. Whatever your ʻohana’s traditions — Happy Holidays from the ‘Ulu‘ulu crew! We would like to introduce you to a recent ʻUluʻulu acquisition: The ʻIolani Palace Collection from the Friends of ʻIolani Palace. King Kālakauaʻs vision for Hawaiʻi can be seen through the architecture and building of ʻIolani Palace. Built as a statement to the world and infused with Hawaiian symbols to establish his trust with the people, the palace is a hybrid of Hawaiian and western worldviews. The palace had fallen into disrepair after being used as government offices during the various governing eras of the Provisional Government, the Republic of Hawaiʻi and the Territory of Hawaiʻi. In the late 1960s after the government offices moved to the new Capitol Building, the restoration process on the palace began. This collection includes 156 tapes and motion picture film reels documenting the restoration process and events like the Centennial Jubilee and Regatta. These materials will soon be available to researchers and demonstrate the mission of ʻIolani Palace: “to preserve, restore, interpret, share, and celebrate the unique cultural, historical, and spiritual qualities of ʻIolani Palace and its grounds for the benefit of native Hawaiians, the people of Hawaiʻi and the world.” As the palace stands as an important site for Hawaiians and others, we take this responsibility of the care and preservation of this collection with great honor. For more about the history of the restoration of ʻIolani Palace, visit their website.